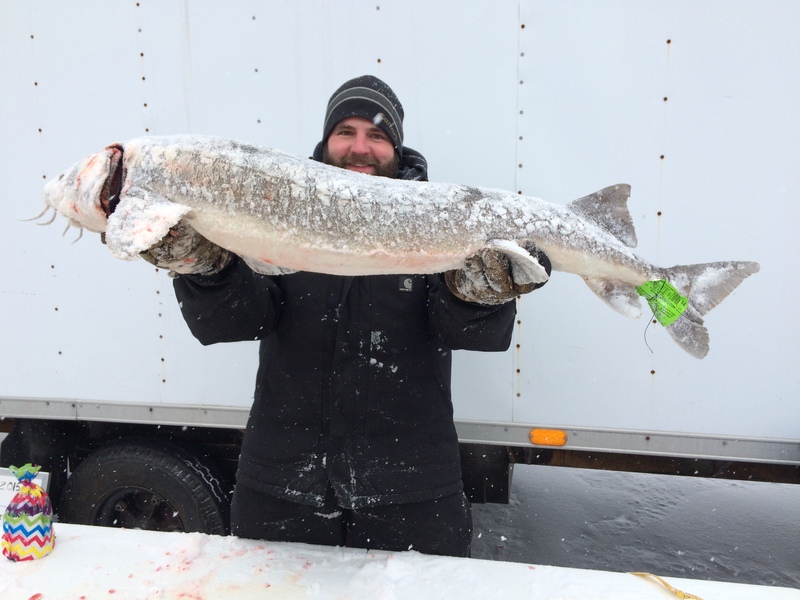 GRAND RAPIDS, MI — More than 300 anglers hoped to spear a sturgeon through the ice when Michigan’s Black Lake sturgeon-spearing season opened Feb. 7. But the five-day season lasted only five and a half hours. Four Michigan anglers, and one from Wisconsin, successfully filled the season’s five-sturgeon quota by 2:12 p.m. on opening day. Doug Blaskowski, of Brutus, who checked in at 2:12 p.m. with a 50-inch, 31-pound female. Black Lake is well-known for its sturgeon population. Located in Cheboygan and Presque Isle counties, the 10,130-acre water body contains just over 1,000 adult sturgeons, according to Cwalinski. His agency and the nonprofit Sturgeon for Tomorrow annually stock it with more than 3,000 young sturgeon that are reared at the nearby Black River sturgeon hatchery. 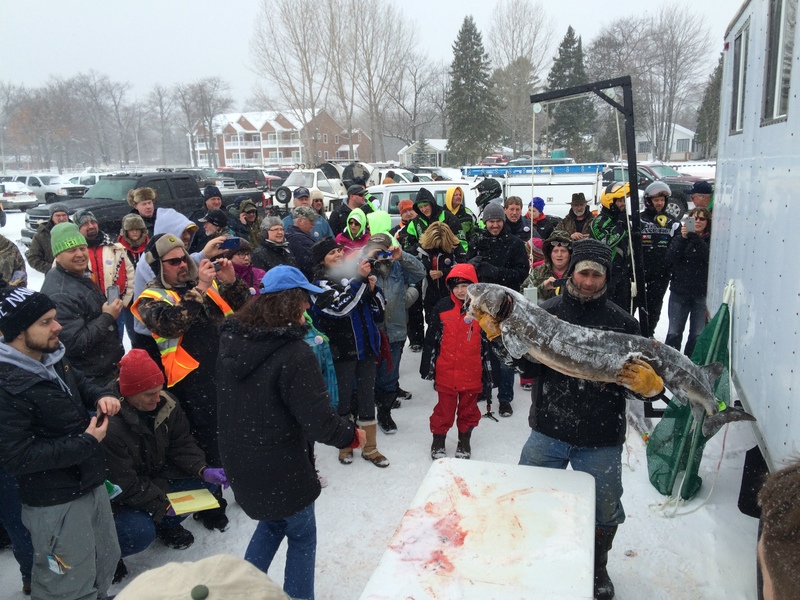 Todd Zeller shows his 69-inch, 80-pound sturgeon to the crowd that gathered for the Black Lake Sturgeon Shivaree. The five-day spearing season draws thousands to the area. Most come for the Black Lake Sturgeon Shivaree, a weekend fund-raising event sponsored by the Black Lake Chapter of Sturgeon for Tomorrow, a group working with the DNR to rehabilitate sturgeon populations in the Cheboygan River watershed. The Black Lake sturgeon fishery was an open fishery until 1997 when DNR researchers determined that the population had declined below historic levels. Discussions with local anglers led to the formation of the Black Lake Chapter of SFT, and a restricted season took effect in 2000. The chapter and DNR have since worked to increase numbers. Archambo believes the sturgeon population is now large enough to sustain an increased harvest in future years. The annual quota is determined by a formula that allows 1.2 percent of the adult population to be harvested, 12 sturgeon for the 2015 season. That allocation was split between anglers and five Indian tribes. The angler quota is set at five to avoid going over the six-sturgeon limit. This entry was posted in Uncategorized and tagged Black Lake, DNR, Fish, Fishing, Ice fishing, Lake sturgeon, Michigan, Michigan Department of Natural Resources, Spearing, Sturgeon for Tomorrow. Bookmark the permalink.